What is inside an atom between the nucleus and the electron? Usually there is nothing, but why could there not be other particles too? If the electron orbits the nucleus at a great distance, there is plenty of space in between for other atoms. A "giant atom" could be created, filled with ordinary atoms. All these atoms form a weak bond, creating a new, exotic state of matter at cold temperatures, referred to as Rydberg polarons. A team of researchers has now presented this state of matter in the journal Physical Review Letters. The theoretical work was done at TU Wien (Vienna) and Harvard University, the experiment was performed at Rice University in Houston (Texas). Two special fields of atomic physics, which can only be studied in extreme conditions, have been combined in this research project: Bose-Einstein condensates and Rydberg atoms. A Bose-Einstein condensate is a state of matter created by atoms at ultracold temperatures, close to absolute zero. Rydberg atoms are those in which one single electron is lifted into a highly excited state and orbits the nucleus at a very large distance. "The average distance between the electron and its nucleus can be as large as several hundred nanometres—that is more than a thousand times the radius of a hydrogen atom," says Professor Joachim Burgdörfer. Together with Prof. Shuhei Yoshida (both TU Wien, Vienna), he has been studying the properties of such Rydberg atoms for years. First, a Bose-Einstein condensate was created with strontium atoms. 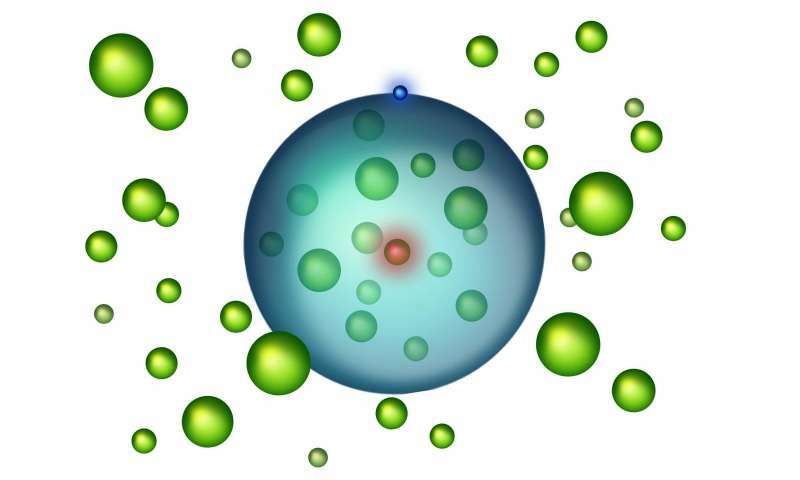 Using a laser, energy was transferred to one of these atoms, turning it into a Rydberg atom with a huge atomic radius. The radius of the orbit in which the electron moves around the nucleus is much larger than the typical distance between two atoms in the condensate. Therefore, the electron orbits its own atomic nucleus, while numerous other atoms lie inside its orbit, too. Depending on the radius of the Rydberg atom and the density of the Bose-Einstein condensate, as many as 170 additional strontium atoms may be enclosed by the huge electronic orbit. These atoms have a minimal influence on the Rydberg electron's path. "The atoms do not carry any electric charge, therefore, they only exert a minimal force on the electron," says Shuhei Yoshida. But to a very small degree, the electron is still influenced by the presence of the neutral atoms along its path. It is scattered at the neutral atoms, but only very slightly, without ever leaving its orbit. The quantum physics of slow electrons permits this kind of scattering, which does not transfer the electron into a different state. As computer simulations show, this comparatively weak kind of interaction decreases the total energy of the system, and a bond between the Rydberg atom and the other atoms inside the electronic orbit is created. "It is a highly unusual situation," says Shuhei Yoshida. "Normally, we are dealing with charged nuclei binding electrons around them. Here, we have an electron binding neutral atoms." This bond is much weaker than the bond between atoms in a crystal. Therefore, this exotic state of matter, called Rydberg polarons, can only be detected at very low temperatures. If the particles were moving any faster, the bond would break. "For us, this new, weakly bound state of matter is an exciting new possibility of investigating the physics of ultracold atoms," says Joachim Burgdörfer. "That way one can probe the properties of a Bose-Einstein condensate on very small scales with very high precision."